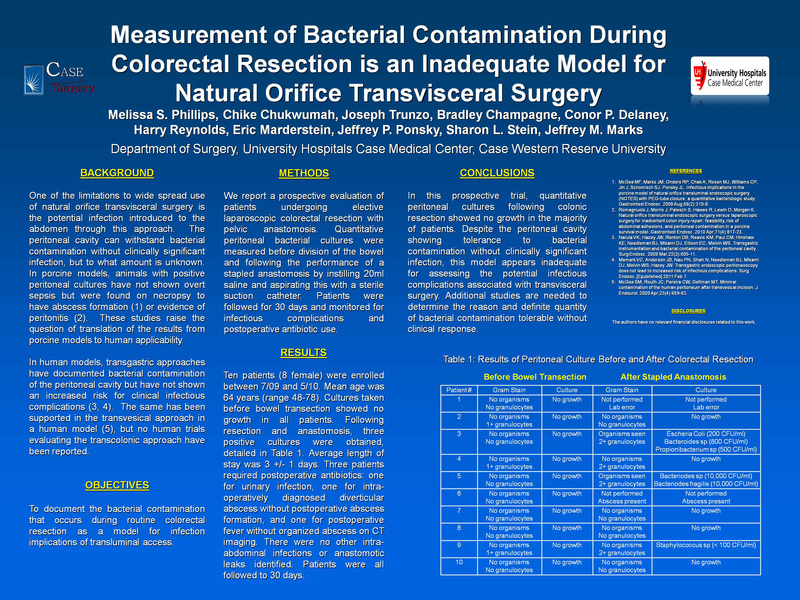 Introduction: Many reports have been published showing bacterial contamination as a model of safety for natural orifice transvisceral surgery. The peritoneal cavity can withstand bacterial contamination without clinically significant infection, but to what amount is unknown. Documentation regarding the infectious implications of transluminal access is required before generalization of this technique. Methods: Prospective evaluation of patients undergoing elective laparoscopic colorectal resection with pelvic anastomosis. Quantitative peritoneal bacterial cultures were measured before division of the bowel and following the performance of a stapled anastomosis. Patients were followed for 30 days and monitored for infectious complications and postoperative antibiotic use. Results: Twelve patients (10 female) were enrolled between 7/09 and 5/10. Mean age was 64 years (range 48-78). Cultures taken before bowel transaction showed no growth in all patients. Following resection and anastomosis, three positive cultures were obtained: one polymicrobial including E.Coli (200 CFU/ml), Bacteroides sp (800CFU/ml) and Propionibacterium sp (500CFU/ml), one Bacteroides sp (10,000CFU/ml) and one Staphylococcus sp (<100CFU/ml). Average length of stay was 3 ± 1 days. Three patients required postoperative antibiotic therapy: one for urinary infection, one for intraoperatively diagnosed diverticular abscess without postoperative abscess formation, and one for postoperative fever without organized abscess on CT imaging. There were no other intra-abdominal infections or anastomotic leaks identified. Patients were all followed to 30 days. Conclusions: In this prospective trial, quantitative peritoneal cultures following colonic resection showed no growth in the majority of patients. Despite the peritoneal cavity showing tolerance to bacterial contamination without clinically significant infection, this model appears inadequate for assessing the potential infectious complications associated with transvisceral surgery. Additional studies are needed to determine the reason and definite quantity of bacterial contamination tolerable without clinical response.